IM BACK! Gosh I can't put into words how happy I was when I set my Tripod up earlier to take some outfit snaps earlier! I don't feel like my photos are quite right yet, I probably need to practice a bit more before I can get a style done! I don't have as the same ammount of room in my new bedroom as I did my old one so it might be a while before I can work out exactly how Im going to take them! In these Im lit from the side, which is alright but I prefer having the light front facing! #bloggerproblems! So, the outfit! I picked up this camouflage jacket a few weeks ago from Primark for around £12. Im not 100% sold on the camo jacket trend, I think they can look really… mannish and unflattering but this jacket has grown on me. I had to pick off all the horrible Primark embroidery, but I do think overall it's quite nice! Im wearing a standard LLYMLRS oversized smock dress, statement necklace and my much loved Topshop Alvins. Im in the market for a new pair of boots as these ones have had so much wear since I bought them a few months ago. I'd love a pretty pair of brown/tan ones! Need to get searching! I got my hair done on Friday, so as you can see it's a lot blonder than it was. I've done a full post on it on my other blog as I had a feeling this blog post would get super long if I didn't split it! I have so much I want to share but literally don't want to bore you all with a huge paragraph of my rambling! I also included a little video ramble that I made for my Youtube Channel (which I thought I deleted earlier and gave myself a heart attack!) so you can see me moving and stuff! And get a better idea on my new hair! It just doesn't photograph or translate well to camera like it does in real life! Sigh! Anyway, if you'd subscribe it would make me happy! Now please excuse me while I go pamper myself and order some nice new things! It's so nice to be around all my products, lotions and potions again and be able to buy clothes without having to worry about how Im actually going to get them back to London! Time for Face mask, Hair mask, Nails… the works! The ammount of exclamation marks in this post just shows how happy I am to be back! YAY youre back! The hair looks great! You sound really happy which is lovely! check out my halloween outfit ! The camo jacket looks so light and floaty - most of the ones I've seen are heavy and I think that's what makes them look more masculine...this one is perfectly feminine! i absolutely love your hair! Glad you're back! Had missed reading your posts! And your hair looks freaking awesome by the way! Having a MAC MAKEUP GIVEAWAY on my blog if you want to have a look? check out my giveaway, it's worldwide! doing a giveaway on my blog! Love the boots! the dress is gorge too. LOVE your hair color! you look great! Welcome back! 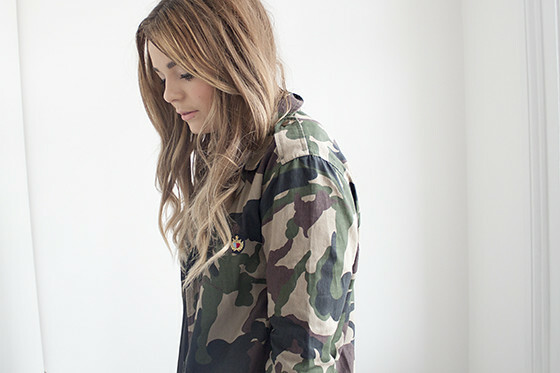 I would never have guessed that Camo jacket is from Primark actually, it looks really nice! So glad to have you back! I actually really like the lighting in these photos, think it looks brighter than in your old room. You look beautiful as always! Love this outfit! Thought that camo jacket from primark was a really bad copy of other ones but it looks really good on you! I love your new hair and this look ! I love your new hair, it's beautiful shade and really suits you! 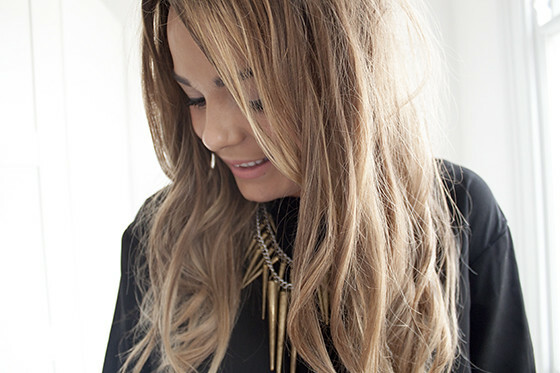 Your new hair looks gorgeous, you really suit the blonder tones! I definitely agree with you about camouflage jackets looking quite masculine but it looks great on you. please follow me im starting at the bloggers world..
love the jacket but they don't suit me at all. do a post about your 5 favourite items in your wardrobe! CUTE outfit! you can really tell how good the light is in your new room, the photos look really great! Oh wow i love this outfit. God I'm such a huge fan of your blog, or basically of you yourself. You're such an inspiration!! It would mean so much to me if you would check out my blog. Welcome back :) You look so stunning, I love love love your hair, the colour looks amazing :) I'm having mine cut tomorrow and am super excited! I love the camo jacket:)! I knew your hair looked different, I really really like it! what shade of lippy have you on?? I can't see the dress on ASOS, do you have a direct link? I've tried the one above but it sends me to the ASOS homepage. I'm pretty sure its sold out, i did have a quick look but couldn't find it! I love your new hair colour! It really suits you! Your looks amazing Lily, the lighter tones really suit you! Your hair colour is soooooooooo lovely.